Primitive Doll Quilt *SOLD* Thank you! 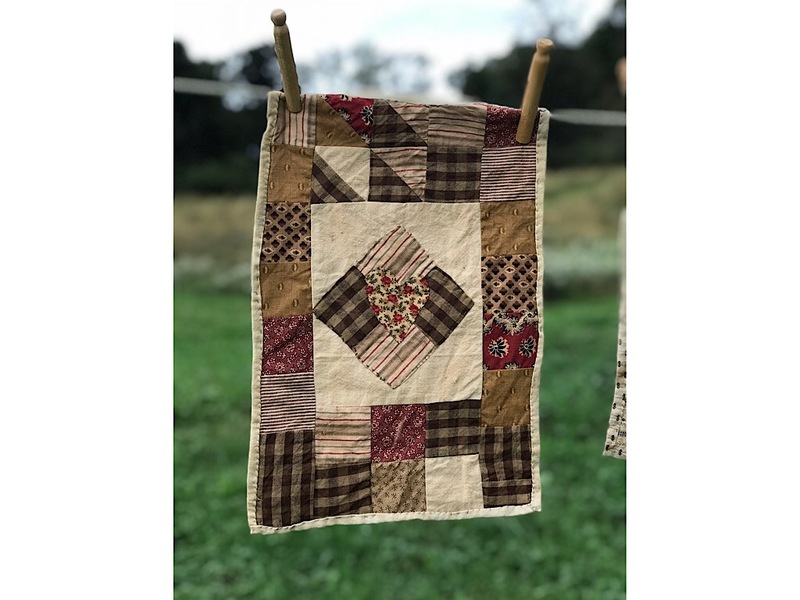 Primitive doll quilt in shades of reds and browns. Just like a young girl learning her sewing skills, the seams don’t match and the corners aren’t square but that’s just part of the charm of this aged and primly done piece. All visible stitching is done by hand. The fabric has been aged with pin pricks, worn out seams, and over dying for some appropriate age. The fabrics are a mix of old feedsack solid, repro homespun, and civil war era repro printed cottons. The center diamond patch features an appliqué stitched heart. In keeping with 1800’s quilting traditions, the backing fabric is folded to the front and stitched down to form the binding. The backing on this sweet quilt is an old printed feedsack with a design in red and blue slightly visible. 10x15”. Shipping is included in price. Please contact me with any questions.